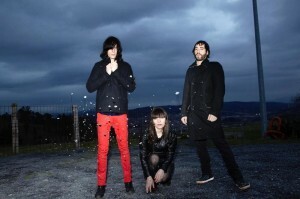 Argentinean-born trio Capsula has released their sophomore album, In the Land of Silver Souls. The album overall blankets varying influences of different rock decades. It takes you from the mid to late 60’s straight to a touch of the early 80’s in fourteen songs. The album also encompasses many differing energy levels from stoned and catatonic to a Red Bull overdose. Its tough to compare them to anyone we’ve heard before, although vocally there is definitely some David Bowie reminiscent of his Labyrinth days lost in there. “Wild Fascination” has an extremely psychedelic appeal, painting a picture of lava lamps and mushrooms all the way through. It is also where the Bowie comparison comes in the strongest. Their first single “Hit ‘n’ Mis” offers a garage rock comfort although personally I think the first single should have been “Town of Sorrow”, hopefully it will be the next up. The title track, “In the Land of Silver Souls”, has a contagious beat; one that truly makes you want to see them live. “Under the Woods” brings it down to a much mellower note, I felt this song would be in my rotation directly after something off Mazzy Star’s Among My Swan circa 1996. While “The King of the Rain” mentally brought me to an old Levi’s commercial; A loner in rugged ripped jeans standing in the desert. Or maybe the desert vision was just the call of Peyote and any other hallucinogenic cactus I could get my hands on for a proper Capsula experience.